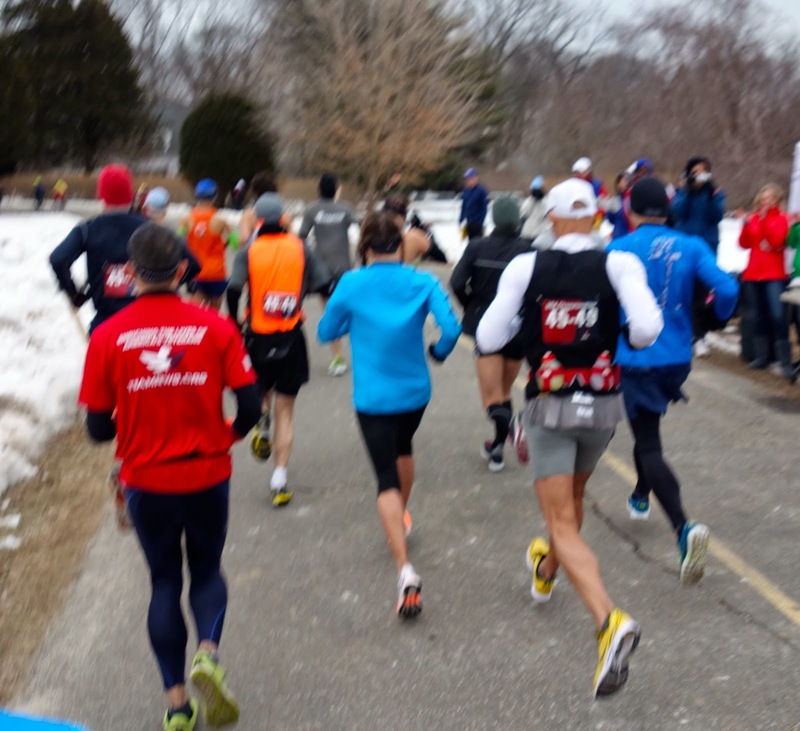 The temperature just crested the freezing point as ~200 runners counted down the start of the Caumsett Park 50k in Lloyd Harbor, NY, last Sunday. 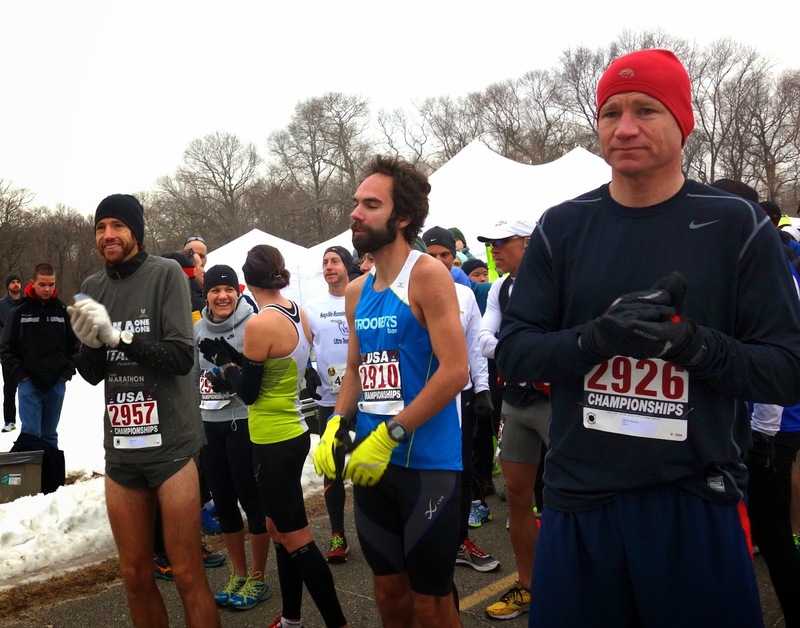 It was once again time for the USATF 50k National Road Championships, and I was back for the second time after my breakthrough PR here four years ago (3:20:48). I'm a bit older now, but also more experienced, and like most Masters runners I was curious if the equilibrium state of age and wisdom was still net positive and PR-worthy. It was going to be a fast race for sure, and just ten weeks off my broken collarbone, it would guarantee what we all hope for in a race - an epic result or an epic blow up, and a trip to the pain cave either way. 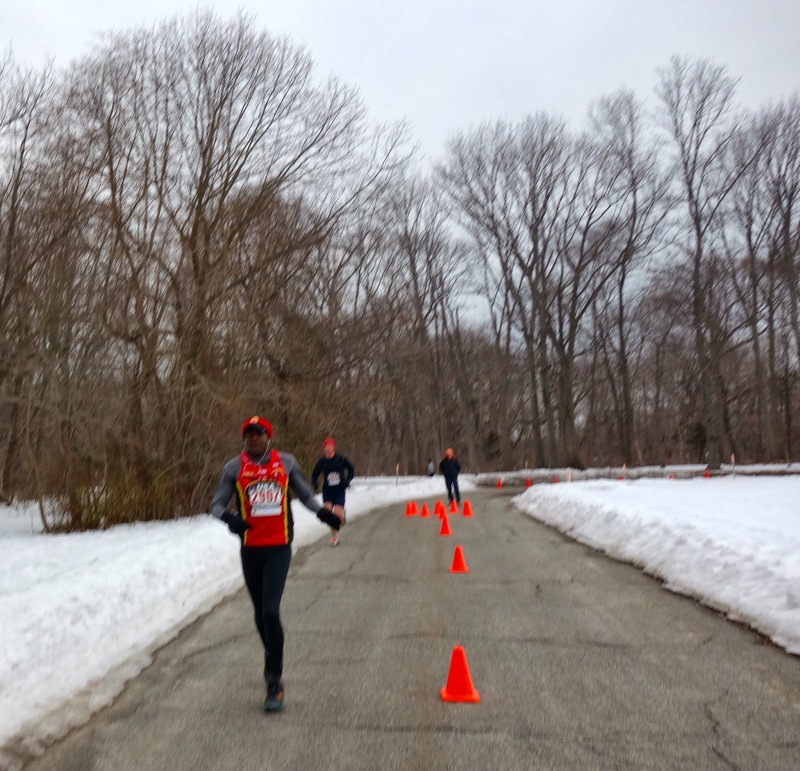 Mother Nature gave us a nod by parting the snowy skies for a few hours, just enough time to enjoy the speedy 10x5k loop course. 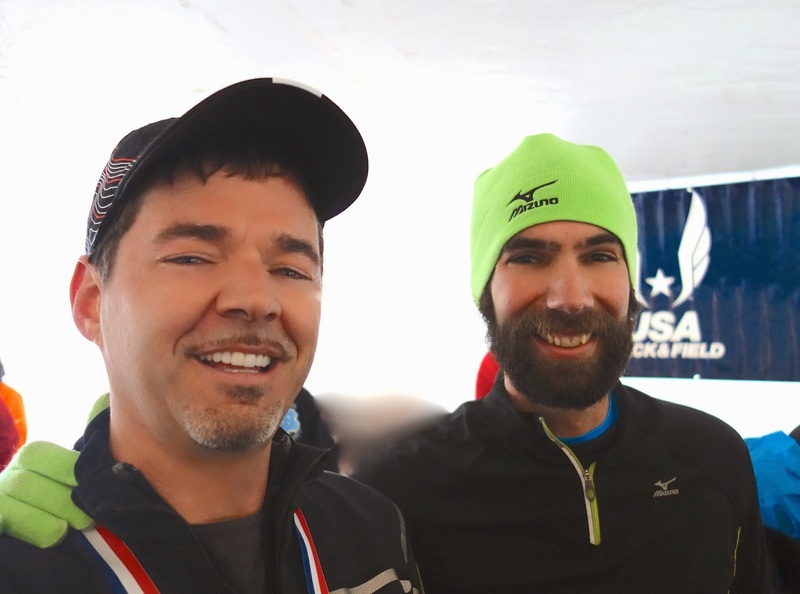 I found some familiar faces in the ready tent, including the always-encouraging Michael Wardian (4-time winner, and course record holder in 2:55:05), Joe Gray (defending champion, coming off his NACAC Cross Country victory last week), Jean Pommier (who celebrated his 50th birthday the day before, and had his eyes on the 3:19:13 American Age Group record), Ian Torrence (here to run and coach Women's front-runner Emily Harrison), and met many new faces too from the Greater Long Island Running Club (GLIRC) putting on the race. I shared my goals for the day - shoot for my PR of 3:20:45 that I did here in 2010, and hope my collarbone didn't scream bloody murder. Although I've been running well the last month, my 2-3x weekly plank and core workouts have been nonexistent as I work on fundamental range of motion for my left shoulder...only one way to find out where it stands, and that's to toe the line! As the gun went off at 8:30am, Michael Wardian, Joe Gray, and Tennessee's Ethan Coffey took it out at a 5:35 min/mile pace and left the rest of us in the snow dust. Emily Harrison (who had told me "I'm going for 6:10 pace" at the start...ummm, see you at the finish!) 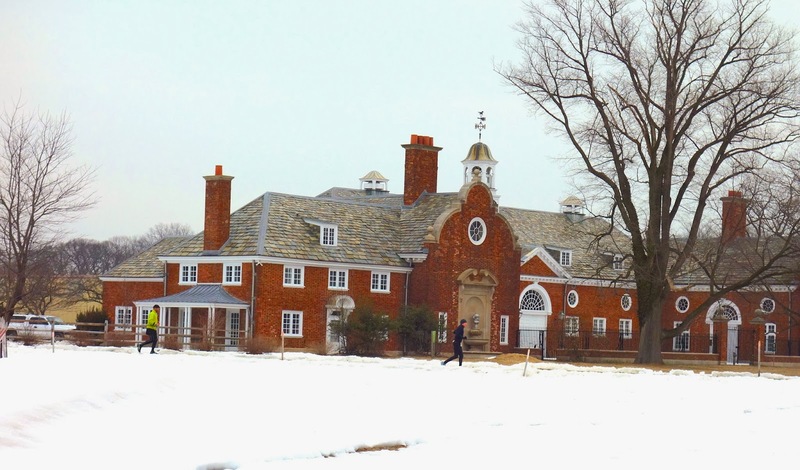 was next with the lead Master Boyd Carrington, and 36-year-old Josh Ferenc. I snuggled up next to Jean Pommier, knowing how great he is at pacing in the early stages of the race. Our math was straight forward - 20 minutes per loop would get me to 3:20, and Jean within reach of the 50-54 AR, freezing cold be damned. 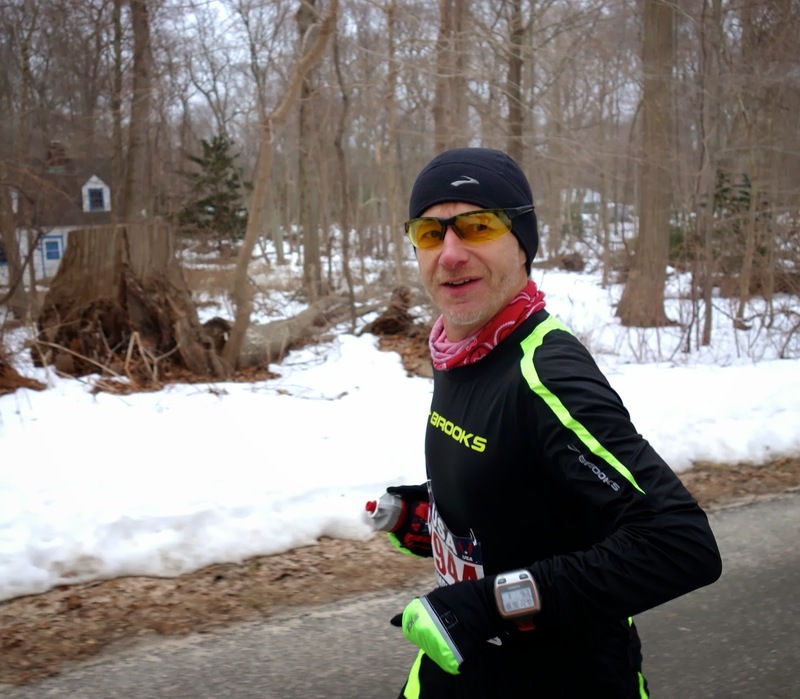 Within two miles, we found ourselves with 46-year-old Alex Hetherington, a retired Lt. Colonel and former pilot for the Marines who has clocked plenty of 2:30'ish finish times at the Marine Corp Marathon, who was also on the same pace. We shared few words as the three of us clinically made our way through the first seven laps, now run in the counterclockwise direction (which felt easier to me). The lap times were very consistent - 20:23, 19:30, 19:33, 19:51, 19:58, 20:06, 20:47 - and I was impressed that Jean was doing so well given he had just come off an injury. Alex did a fair share of pacing with his long 6'5" strides, and had his eyes set on Boyd Carrington, who remained just 40 seconds up on us the whole time. 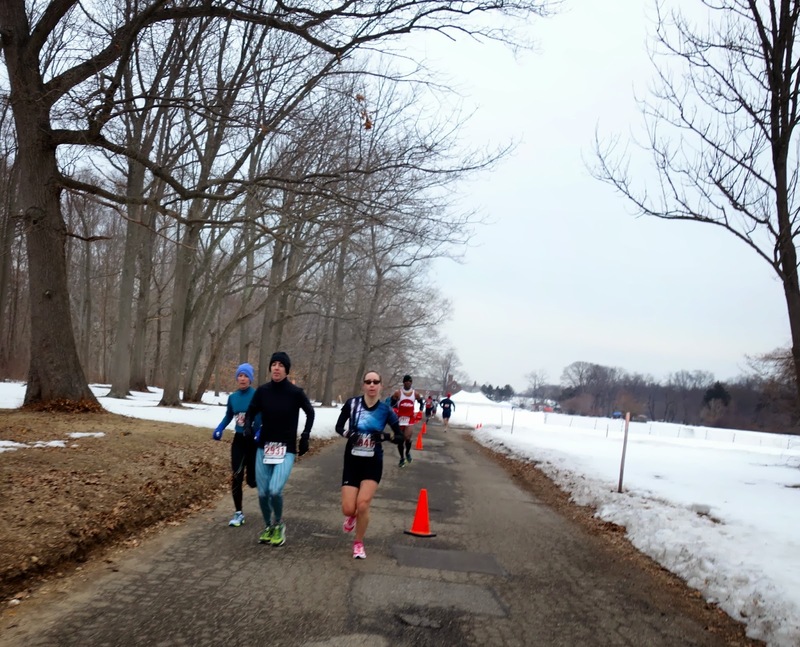 The course had a one-mile out and back section that made it easy to see where your competition was, and I enjoyed how we all corrected our posture and smiled so as not to broadcast any weaknesses. By the time we started lap 7, the Masters competition was the four of us - Boyd, Alex, Jean, and me - with everyone else a solid 7-8 minutes back. 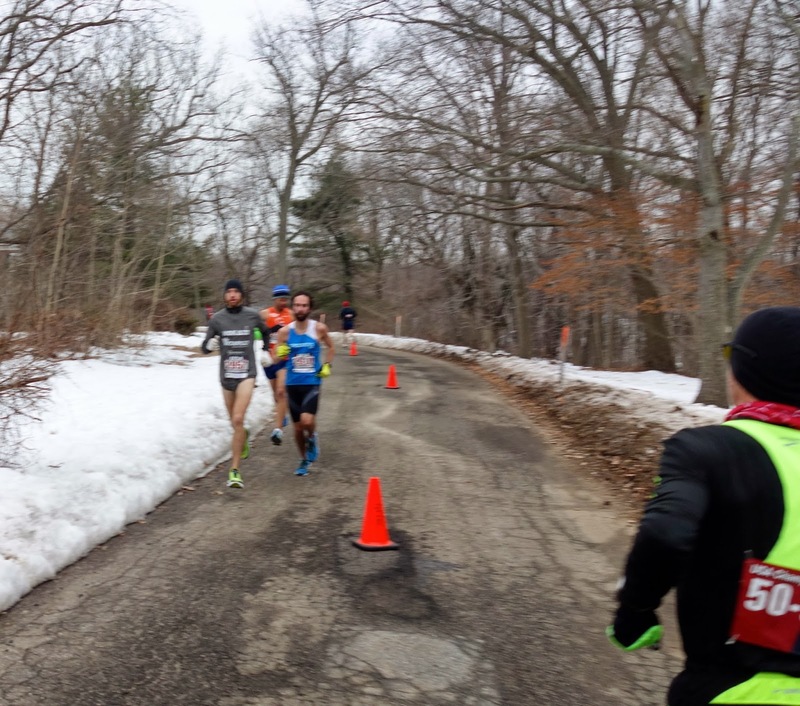 Up front, Ethan Coffey had broken off the lead pack with Michael Wardian still going strong a minute back, while Joe Gray dropped at mile 22 (kinda tired after that NACAC victory). I watched Ethan go through the start/finish on lap 7, a minute under the course record time. Emily Harrison was all by herself now, and only getting faster. By lap 8, she was so far ahead we couldn't see her. That means she was on track for the $1,000 bonus for a CR, and maybe even another $1,000 for an AR. GO, EMILY!!! As lap 8 continued on, I started to have some issues as my collarbone began exposing its unique fatigue. The titanium plate was frozen (it felt like heartburn in my shoulder...not too bad, but awkward), and the muscles around it soon started to tighten and pull at my neck like a frustrated octopus. Crap, not quite healed. I started doing a limited T-Rex swing with my left arm, which slowed me down about 10-15 seconds per mile. Jean was also slowing, citing some dizziness, so Alex dropped us both and pressed forward to catch Boyd. I hit the marathon mark in 2:50:57 (BQ! 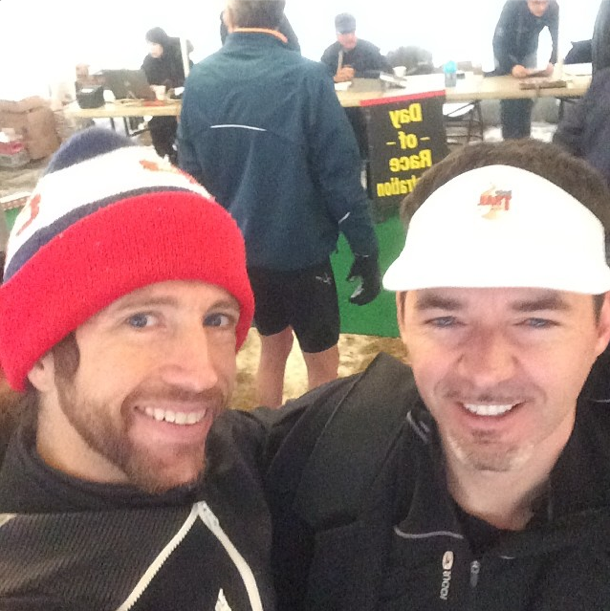 ), and walked a few aid stations to catch up on liquids and beat back my twitchy calves. Each rest allowed my neck to loosen up, surprisingly, so I kept taking 5-second walks and hoped Jean "The Closer" Pommier wouldn't catch me. The last out and back showed me my standings - Alex was catching Boyd, but they were three minutes up now, and Jean was nowhere behind me. If I kept at it, I would be in the Top 10 and Top 3 for Masters. Michael Wardian gave me one last word of encouragement as he cruised by for his finish (that means I would be lapped AND chicked today), and I leaned forward for the last lap. 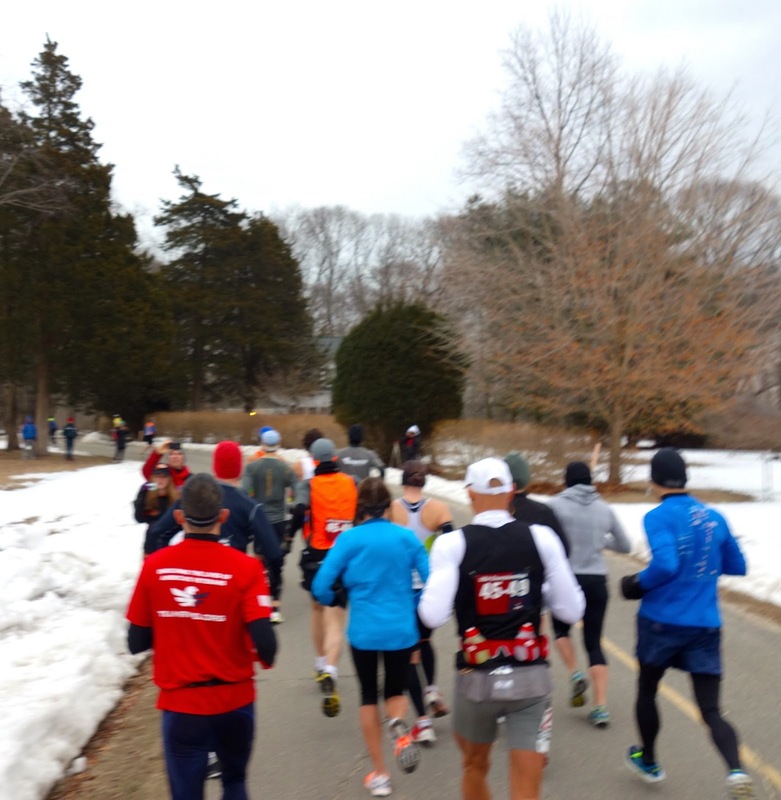 Lap 10, in true last lap form, was a blur of this-is-why-we-do-speedwork mantras, whimpers, and the soundtrack of the Pharrell Williams song "Happy" which had been stuck in my head for most of the past week. I distracted myself by cheering on the other runners (one of the great advantages of a loop course), and they were happy to return the favor. As I got to the out-and-back section, Boyd and Alex were shoulder to shoulder in the last 800m! Inspired, I kicked and cruised to the finish in 3:25:49, good enough for 7th place, 2nd AG, and third Master. Phew! I'll take it. I started to ice my shoulder, only to laugh that it was still colder under my skin than on top of it. Such a strange new factor! Jean Pommier (3:37:12) had held on through a tough last lap to get the 10th overall slot and a win in the 50-54 age group, and Taryn Giumento Thomas (3:48:25) and Tracey Meder (3:49:05) filling out the Women's podium. Ian Torrence (3:38:04) stayed solid, enough to get the third M40-44 slot. 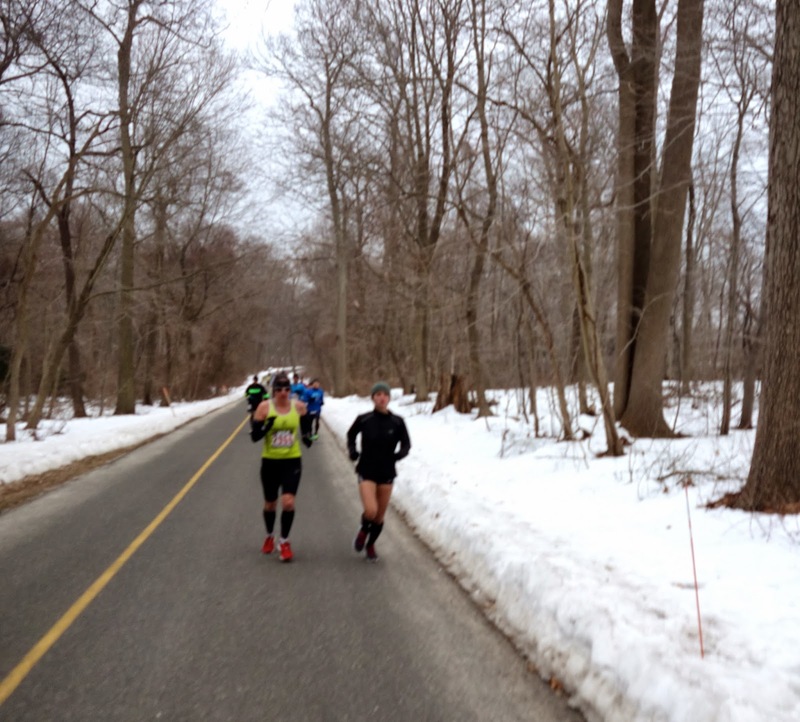 Asking around, there were quite a few PR's today so apparently the cold was just fine. 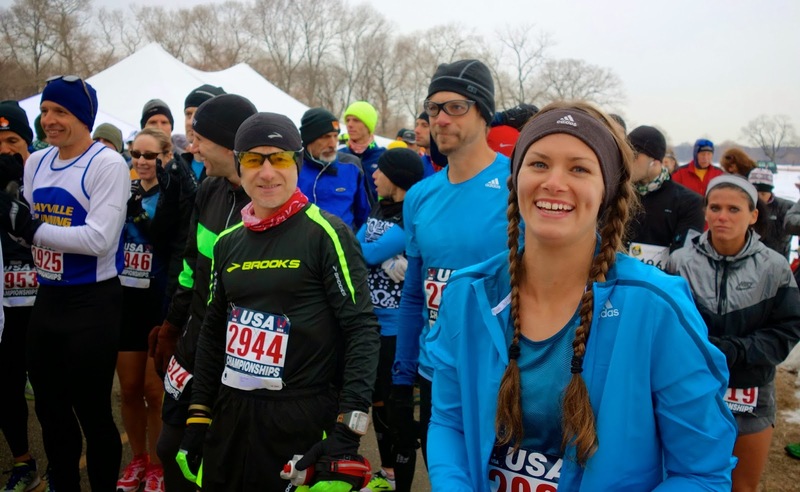 We all enjoyed snacks and congratulated the winners on their big paydays, commenting that this cold day was likely harder for the volunteers than the runners, and they did an amazing job. As the clouds closed in, we all hustled out to catch our planes or get back to the city, frozen smiles still on our faces. 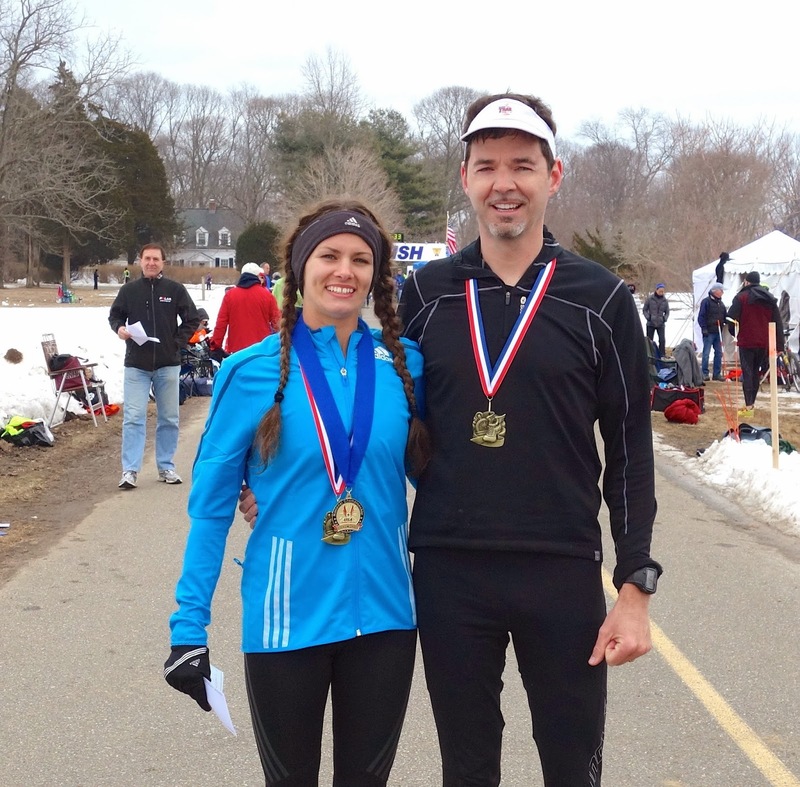 My thanks to the GLIRC and the many volunteers that helped make the 2014 Caumsett 50k a big success, and sealed their fate as one of the fastest courses around. It was great to be back! 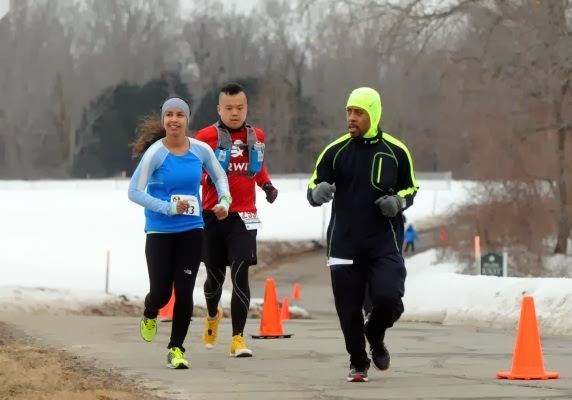 And congrats to all finishers who braved the cold to have a little fun. I will see you again soon. Great account, Scott, so detailed, I almost felt like I ran this race! ;-) Seriously, amazing come back from your collarbone fracture and surgery, and congrats for the Masters' podium! See you at least at TRT and have a great season, hopefully warmer, in the meantime. Safe travels. So glad you came all the way out to join us! Congratulations! Hope to see you next year!!! just ran 20 miles today out and back to Caumsett Park, I live fairly close to there but never wanted to do all those loops for the 50K. Maybe one day!